Santa Rosa de la Mina is a "don't miss it" destination in Santa Cruz! The Chiquitano sun rises slowly and lazily over the forested red clay landscape below. Its yellow and orange fingers of light, extending from an indescribably pink center, creep across the rolling hills toward the opposite edge of the world. As it wakes and stretches, it looks down upon indigo lagoons causing them to sparkle and glimmer which, in turn, arouses the citizens of nearby palm forests. Macaws and bandicoots initiate a busy rustle and chatter among the leaves and thus begins another day at Santa Rosa de la Mina. 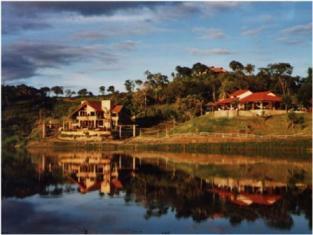 Located just two hours from the city of Santa Cruz along the paved road to the Jesuit Missions of Chiquitos, this remote resort rises like an island of leisure from the jungle floor just as the Eastern plains of Santa Cruz begin to slope and undulate past unending yellow sunflower fields at San Ramón and upward to the town of San Javier. 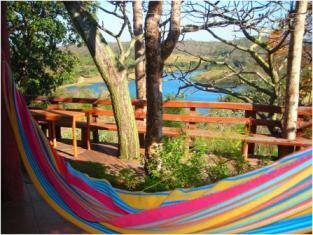 Amidst the twitters and songs of toucans and yellow-breasted boatbills, a hammock swings and creeks and the washy sound of oars rowing over the lake floats upward through the forest to the hilltop cabana where I have just spent a black and starry night. As I walk across the room to the open veranda I look past the breezy purple hammock and down to the lagoon below where a family of five has risen early to enjoy this spectacular sunrise on their backs, afloat on a bright canary-colored raft. The air is filled with the musky smells of papaya and moist clay as I turn quickly to set up my tripod and camera before the last hazy rays of pink sun heat into a blazing white aster for the remainder of the day. Named after a tiny jungle town on the side of the hill Santa Rosa de la Mina, or Holy Rose of the Mine, is a 1200-hectare property that is being developed with just such a sunrise in mind. 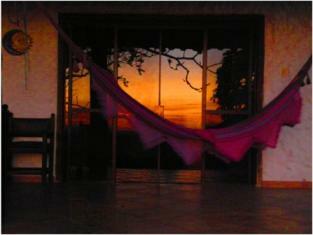 I am convinced that nowhere in Bolivia will visitors arise to a more beautiful morning. Cabanas built on hillsides, a tent camp by the lake, multiple turquoise pools, playgrounds, fishing areas, hiking, three lagoons, a huge club house, horses, rafts and jet skis, the world’s cutest emu (yes, I did say emu), and what is soon to be South America’s largest triple complex of side by side 18-hole golf courses, are what await visitors at this beautiful adventure resort and country club. Owner Hermán Antelo is the man behind the vision, which I attribute to his own artistic inclination. When I saw his display of ancient Andean relics carefully collected over the years, a 16 foot-high carved tree trunk in the club house, and a large oil painting (by Hermán himself) on a cabin wall, I understood how seven red clay hills and a spread of unending green forest could be transformed into an area so colorful and well-planned. And yet it all blends seamlessly into the landscape and if you didn’t know of it you’d probably drive straight past it. That’s because Hermán also ensures all materials such as lumber are left untouched unless needed, that architects incorporate them and design with the landscape in mind, and that visitors conserve the environment for everyone’s enjoyment. Almost all employees are inhabitants from the nearby communities of Santa Rosa de la Mina and San Ramón. As we tour the property Hermán stops the truck frequently to greet each one, surprising me as he asks about their families. Children call him “Tio” (uncle). Santa Rosa de la Mina’s “encargado” (man in charge) stops us to tell him someone has been felling trees in one of the more remote sections of the forest and they appear to be doing so at night, so straight away we drove to check it out. The government will hold Hermán responsible for any uncertified felling. Bolivia is a world leader in certified lumber and forest products and each tree trunk taken from the forest must be accompanied by a certificate of origin. We continue our drive to one of three lagoons on the property where an 80-capacity tent camp is in the works. Here you’ll be able to jet ski, canoe, kayak, do some fishing, or swim. This lagoon already has a dock and will be ready for use by early 2009. Far across the lake two herds have gathered at the edge of the water. One is a small herd of cows, the other a group of pintos Hermán tells me are available for horseback riding. I’m reminded of a children's song as we drive “over the hills and through the woods” to an unexpected second resort-style group of cabanas, 6 in all, built along a slope and overlooking a smaller lagoon. These cabanas are already in use and come fully equipped and furnished. With bedrooms, living rooms, kitchens, and even fireplaces and hammocks, you can easily spend an idyllic weekend with the entire family. There is a large L-shaped pool here and a huge playground for kids. Just bring some food if you plan to cook as these cabanas already have everything else, down to the very last dish. Back at the main compound you can have lunch or dinner between Thursdays and Sundays at the Club House if cooking makes vacation seem “un-vacationly”. When the golf course (designed by French golf course architect Christian Pensu) opens in mid-2009, the restaurant will operate seven days a week. It sits atop a hill overlooking a series of pools surrounded by woods, the largest of which slopes gradually down from a depth of 1 inch to about 6 feet. A smaller round children's pool is only knee deep and to your right you can play sand volleyball. Past the enormous dining room is a full bar and beyond that, a spa complete with saunas, showers, card tables and a great big hot tub overlooking the hills. This area is also already in use and has hosted several events (birthdays, weddings, etc.) People frequently stop here for lunch on their way to and from San Javier or Concepción. You are close enough to make a day-trip to either one of those Jesuit Mission towns. 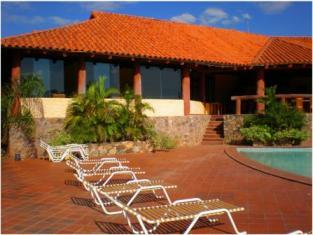 Conversely, if you are spending time there, plan to spend a day or two at Santa Rosa de la Mina. This country club also functions as a condominium. Several parcels of land around the lagoons are for sale (some have already sold). Owners build their own cabanas, although these must comply with condo specifications regarding architecture, design, facilities and some amenities. Condo owners pay a low monthly maintenance fee to cover security, landscaping and other expenses and have the right to full use of all facilities at the resort. A small on-site gold mine, discovered quite by accident, provides the funding needed for the 18-hole golf course that is currently under construction. Once the course is finished, the mine will be sealed. Run-off water is collected, recycled and re-used in lagoons for irrigation and other purposes and any trees felled are stacked and used to build the cabanas, intricately carved furniture, rustic beams, and more. Cows, goats, roadrunners, horses, butterflies, and numerous species of tropical birds share the area even as construction on the golf course is underway. It isn’t unusual to see Piyo the Emu wandering across a future putting green, turning his head left and right and looking quite like an inspector on duty. There are very few alternatives for golf enthusiasts in Bolivia. Most golf courses in Bolivia are open only to members who pay monthly dues and other fees and do not admit visitors. Santa Rosa de la Mina, on the other hand, is being developed specifically for the golf tourist market so you'll never be turned away! This may well be the only golf tour package available in Bolivia. Santa Rosa de la Mina, in addition to providing employment for local communities, is designed to be fully self-sustainable. Management has already begun an intensive marketing campaign to spread the news amongst travel agencies about this unique golf and country club in the heart of South America. Although it is often promoted as a golfer’s destination, it has been designed for families, tourists and adventure lovers. After all, South America’s most beautiful sunrises and spectacular sunsets were not meant to be enjoyed from the seat of a golf cart. 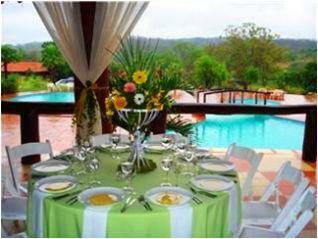 Learn more about Santa Rosa de la Mina Golf Resort and Country Club. View their bilingual website for more information and photos. Future plans include a 5-star hotel, 2 more 18-hole golf courses, a boutique hotel, and more cabanas. Santa Rosa de la Mina has offices in the city of Santa Cruz. Use the contact form below to send a secure email directly from this page.